Do you love cherry pie…but know that you would love it even more if you could get a top-quality pie filling? Wish no more: Chukar Cherries, a purveyor of the finest cherries and cherry products made from Washington State cherries, makes the best cherry pie and cobbler fillings we’ve ever seen commercially (all natural and certified kosher). Cherry Blueberry filling is made from tart Montmorency cherries plus blueberries (think of it as the high-antioxidant pie filling). Triple Cherry filling combines Bing, Rainier and Montmorency cherries. You can these high-quality toppers on muffins, ice cream, puddings and other desserts. Since George Washington’s actual birth date is February 22nd, bake a pie or cobbler in his honor*—you’ll save so much time with these cherries that you can make a homemade crust. When you order the cherry pie filling, check out the delicious preserves, toppings and barbecue sauces—and the scrumptious dried cherries, far finer than much of what is available.- Read our review of Chukar Cherries pie fillings and other baking products. Read our review of Chukar’s premium dried cherries. Finish with a look at their cherry preserves and dessert toppings. Can she bake a cherry pie, Billy Boy? 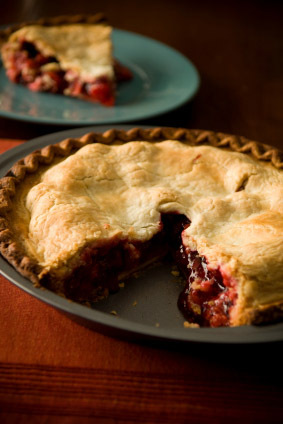 Anyone can bake one, easily, with Chukar Cherries gourmet pie and cobbler fillings. *Historical note: George Washington did not chop down a cherry tree in his youth and then say, “Father, I cannot tell a lie.” This story and others, like throwing the silver dollar all the way across the Delaware River, were fabricated by an earlier biographer. Learn more cherry facts.